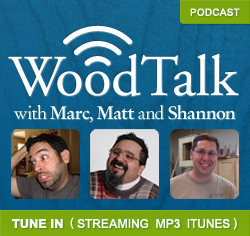 The latest Wood Talk isn’t messing around! Stop what you’re doing and listen right now! It’s got Chuck Norris in the title after all! On today’s show, we’re looking at the year in review. We’ll also discuss the wide world of hand planes, wood movement after milling, digital vs print magazines, the Domino vs the Multi-Router, and oil finishes causing blotching in cherry. Gary Rogowski shows you how to level legs at the tablesaw. Chris Schwarz sets the record straight after a flub in a recent Fine Woodworking article. Cool commercial showing amazing wooden musical instrument. A suggestion for you to turn in to Woodworking for Mere Mortals on Friday for a special holiday treat! For the rest of the shownotes, including contact information visit www.woodtalkshow.com.